It’s quite something when you can walk into the sequel of a game you spent well over a hundred hours with, and still be floored at the sheer scale and depth at your fingertips. That, in essence, is The Division 2. It’s a world that is never without something to do, and one that’s always moving and changing around you, responding to your actions and growing with your character progression. Tom Clancy’s The Division 2 is a third-person shooter MMORPG, with a heavy focus on customization and loot. Tons of loot. So much loot, in fact, that you will find yourself making adjustments to your loadout every fifteen to twenty minutes. It’s what for many of us comprises the ultimate pinnacle of the expansive “looter-shooter” genre, with a fantastic ability to retain its entertainment factor throughout the grind. 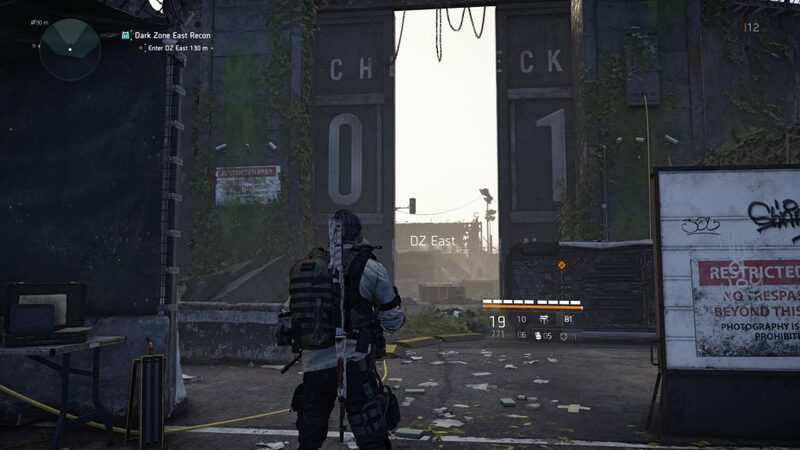 The gameplay and challenge in The Division 2 continue to evolve as you progress through the narrative and into the endgame, with enemies changing their tactics, forcing you to change your loadout and strategies for handling them. The game takes place in disease-ravaged Washington D.C., seven months after the Dollar Flu was released in New York City on Black Friday. The colorful veneer of an overgrown Washington doesn’t hide the more gritty, pandemic aspects of the environment or narrative. 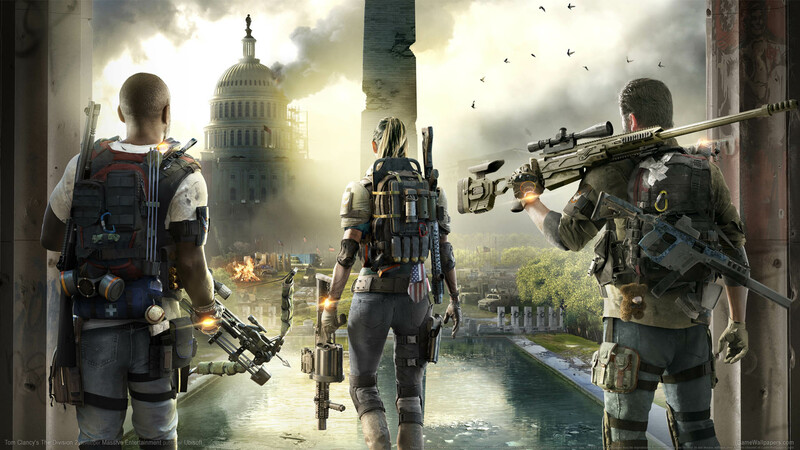 The Division 2 continues to tell a somber story of a fractured society that has been ravaged by the Green Poison. 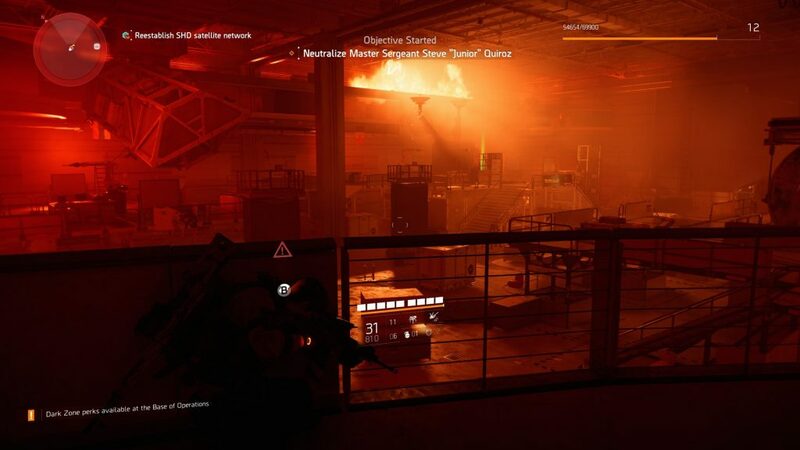 After receiving a distress call from Washington D.C. during an attack in NYC, you head to the Division HQ at the White House at rendezvous with the agents there and find out what has befallen the capital. With the President of the United States captured by one of the warring rival factions, and much of the rest of the leadership dead or missing, you have to begin to wrest control of the city back from the three major groups in order to bring control and stability back to Washington. Each of the three major factions — the Hyenas, the Outcasts, the True Sons — have completely different combat strategies when they engage you, and learning how to predict their tactics is necessary to succeed in combat. 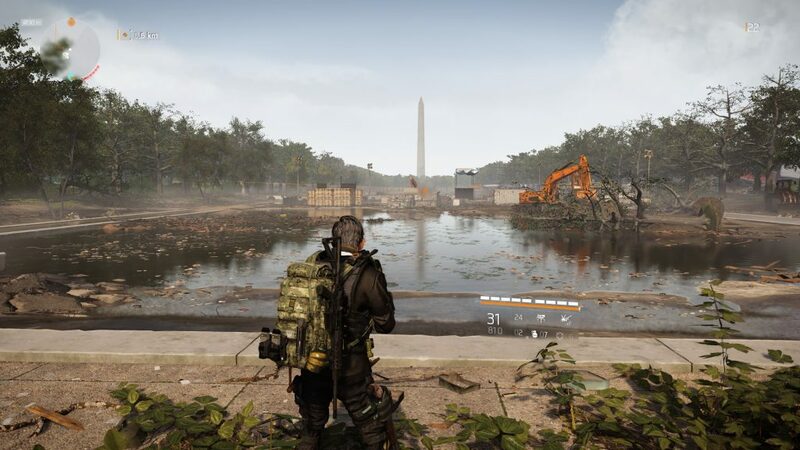 The Division 2 was created with Snow Drop and is an absolutely beautiful game, regardless of if you’re above ground exploring the streets of Washington DC or delving into the ruins of some of the famous buildings from the American History Museum, to the Lincoln Memorial. Occurring 7 months after the events in New York City, vegetation has had a chance to overgrow much of the architecture, giving the environment a very different look and feeling from the previous game. Features like dynamic weather effects add to the realism of the atmosphere and ultimately create a wonderfully immersive experience. I was constantly wanting to explore every alley and side-path, not just to find the loot that was usually contained within, but just to take in more of the scenery. 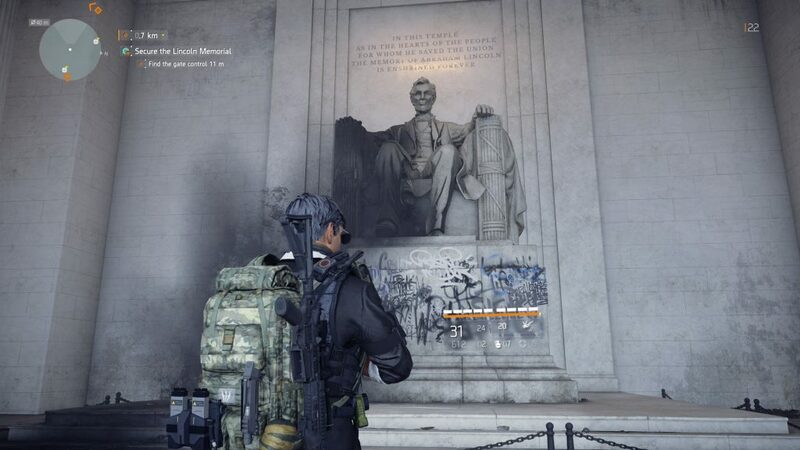 The Division 2 is an exceptionally open game in how it lets you approach both the main story and side objectives. Story and side missions — as well as experience and loot drops — scale up to your level, which gives you a fair amount of freedom to tackle the game in any order that you choose. While it’s a very dangerous idea to head into a region that is far above your level, you don’t have to worry about coming back to side missions you initially passed over, only to find them a cake-walk; the challenge continues to scale. And challenge there is aplenty. 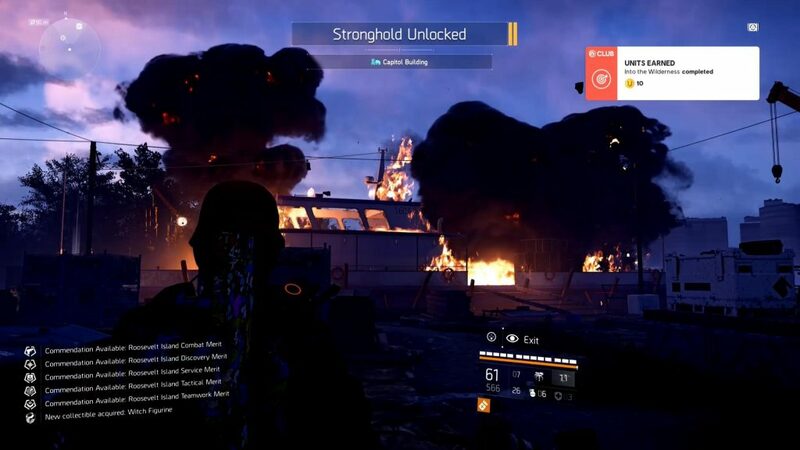 The Division 2 is by no means an easy game, and if you’re playing alone without other SHD Agents to watch your back it can make some of the missions much more slow-paced to complete, as you have to move methodically and use skills sparingly. It’s never too hard, but there were a handful of times that I died and had to reassess my approach and loadout. 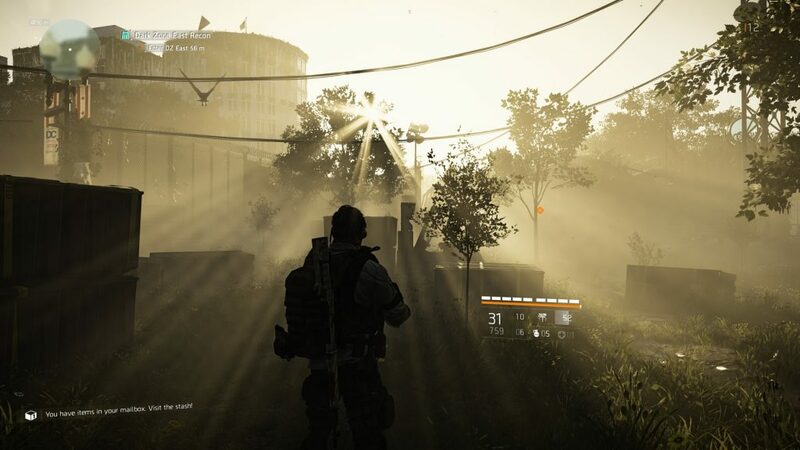 Where The Division 2 has really excelled is in creating a living, breathing world that is full of not only activities to complete, but hidden areas to lose yourself in and more loot than any Agent could ever hope to obtain. In comparison to the first game, which by no means had a dearth of things to do, Washington D.C. feels like a much more vibrant city; if I can use that term for a city that has been ravaged by the Green Poison. Moving through the regions and unlocking new Safe Houses grants access to the network in the region, which locates nearby SHD caches and unlocks new Projects to complete. These Projects are a great way to get out into each Region and get the most out of all of the activities, but they also grant experience, unlock blueprints and provide access to Bounty missions. These missions send you after a high-priority target and reward you with credits and experience upon completion. 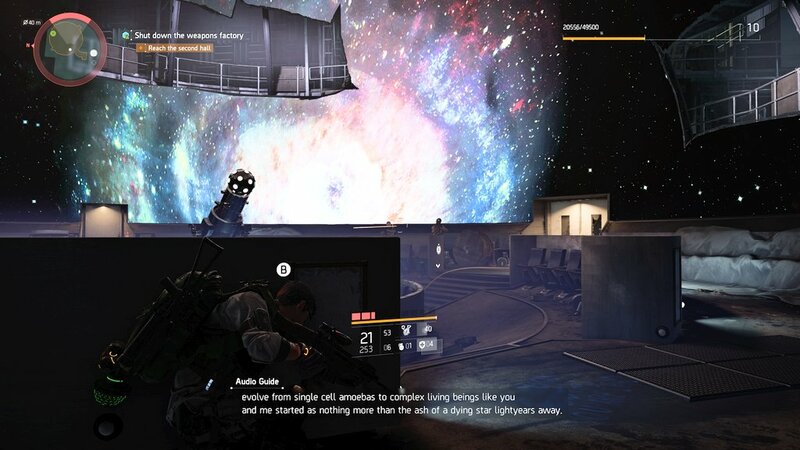 When it comes down to it, there are just a ridiculous amount of things to do in The Division 2. The world is strewn with Echos, collectibles, materials, and equipment to pick up, and every detour through an alley, parking lot or structure is sure to net you some loot. The world is much more open than the previous game, and the expansion of the Underground and the incentive towards a more organic form of exploration has led to some hidden secrets and special loot caches that you will only discover if you travel off the beaten path. Inviting other Agents to join doesn’t by any means make the game any easier; it just means you have someone watching your back. Playing with friends means that the difficulty, and the enemy numbers, scale accordingly. I found that some missions which were moderately challenging on my own became exceptionally difficult once we had three people in the squad. What mattered at the end of the day, was that it was a lot more fun to play with friends and construct our loadouts to compliment one another. Playing with friends, or random gamers through the Matchmaking system, is how The Division 2 is meant to be played. While playing alone doesn’t inherently detract from the experience, being able to strategize with friends to tackle missions and Strongholds felt more engrossing. We were able to plan our skill loadouts so that we covered sneak attacks with the Firefly, health and defense with the Hive and Drone, and offence with the Turret and Seeker Mine. We were able to play off each others’ styles to compliment one another and ultimately succeed mission after mission. The best way to sum up the gameplay in The Division 2 is adaptive. As a SHD Agent you have to be able to adapt to different circumstances utilizing the wealth of skill variants as your disposal, and shifting your equipment loadout to suit various circumstances. Enemies as well are adaptive to these changes that you make and present some intelligent and challenging tactics that you need to be able to respond to on the fly. The world as well feels very much alive, and it shifts and changes according to your actions and progression through the game. In the same way that you’ll see friendly Control Point NPCs off gathering resources to resupply their own points — especially if you aren’t doing it enough yourself — you’ll additionally find hostile patrols guarding or gathering resources for Control Points; at least ones you haven’t already captured. You’ll find out early on that the same struggle for control between factions that plagued New York City has hit the capital. Trying to bring order back to Washington D.C. and going after the various factions will take you across the city and to notable landmarks, and it’s clear that the capital city has been crafted as authentically as possible. 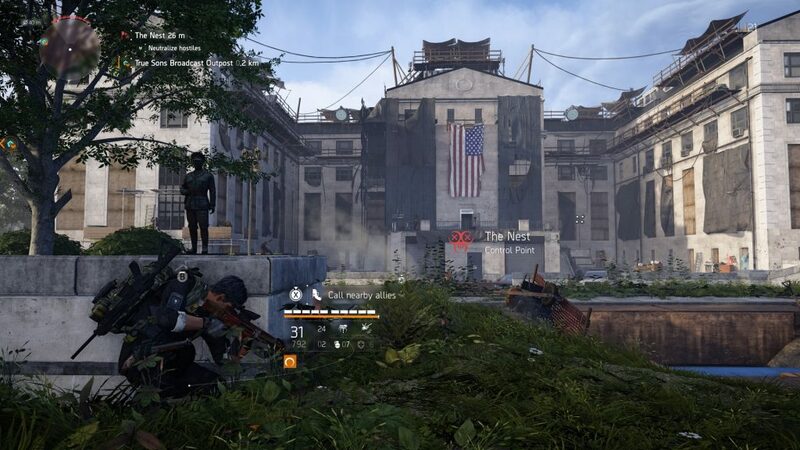 You could spend hours upon hours losing yourself in the back alleys and buildings that have been opened up to put more focus on organic exploration in The Division 2. Much like the world design, the level design of the missions is wonderful and varied, taking you through some of the most famous buildings in the capital city. My personal favorites included the Air and Space Museum, which had one firefight in a planetarium that was memorable. Watching the cosmos whip by as bullets flew around the dome, all the while an audio guide narrating the birth of the cosmos. The absolute wealth of settings you’ll travel across between the dozens of missions are so well differentiated that it keeps you engaged and attentive even through the rhythmic pattern of the gameplay. Most missions follow a fairly repetitive pattern: enter an area, push through successive waves of increasingly difficult enemies, and then defend against an onslaught and a boss battle. It’s the varied tactics of the enemy factions and the shifting environments and scenery that made evvery fight seem brand new, even if the pattern was repetitive. Literally everything in The Division 2 is customizeable. Your guns, your gear, your skills, and your appearance. The Division is at its core a numbers-based game, and Ubisoft gives you the ultimate control to tweak and adjust specific attributes and modifiers so that you can customize your character to fit your playstyle and strategy. Many pieces of gear (and mods for the gear that you can find or craft) will affect one of the three core attributes — Health, Damage, and Skill Power — in addition to increasing your Armor rating. There are no shortage of opportunities to completely change-up your Skill or Gear loadout as you progress through missions. Main Missions will give you the opportunity to unlock new skills, with Side Missions and SHD Missions giving you the necessary components to upgrade those skills with SHD points, craft new Mods for gear and weapons, and add passive modifiers with Perks. 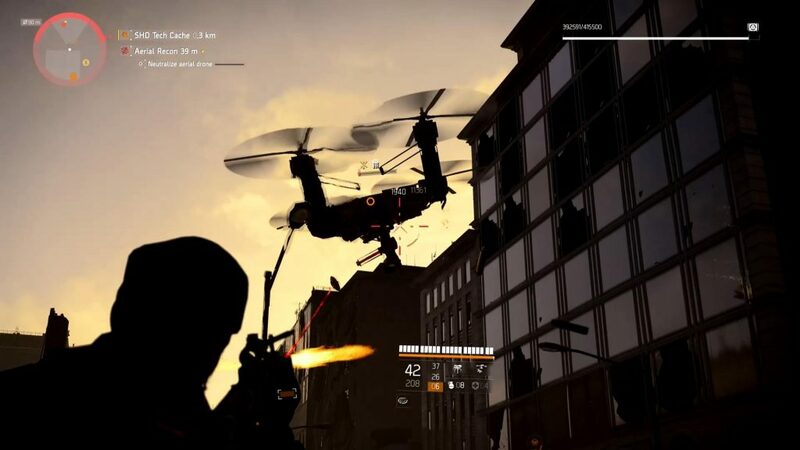 Division veterans will recognize the return of some favorite skills like the Seeker Mine, Drone, and Turret, but some of the most useful and customizeable skills have been introduced new in Washington. 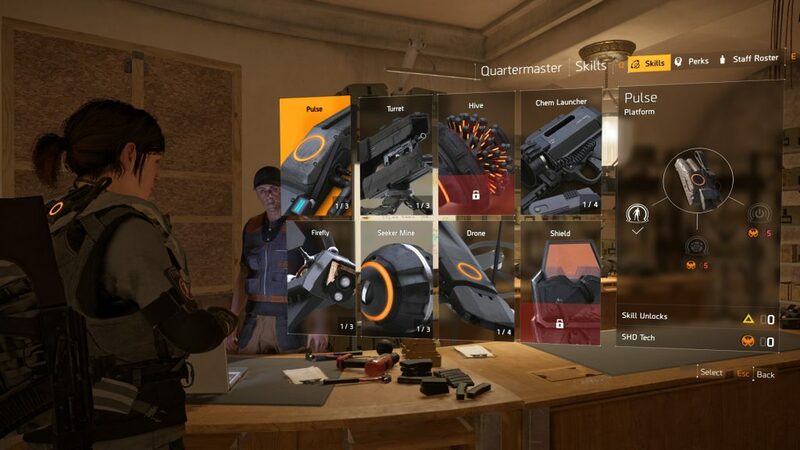 Each skill has three of four variants that can be unlocked with SHD points after you have the base Skill, which means that there are over 25 different Skills to use, and seemingly endless combinations that can yield some fantastic results. My personal favorite was the Firefly, which has a variant that attaches proximity charges to multiple enemies which detonate when they are within range of one another. Used properly, it was possible to take our four or five enemies before a battle even started. Combined with a defensive Skill like the Shield Drone, which deflects incoming bullets, or the Healing Hive, which gradually restores armor, it allowed me to quickly decimate mobs while retaining survivability. If I needed some assistance when I was playing solo, I would just switch up to a Turret variant and the classic Drone to cover my back. While the game mostly functions smoothly, there have been some graphical and gameplay hiccups that broke the immersion at a few points. There was an alleged memory leak that caused game stuttering at launch which I experienced a few times, but that has since been patched out along with a glitch that was causing skills to not function properly, often leading to an untimely death. Unfortunately, some other rather irksome issues have persisted through the patch. When fast-traveling or loading into the game for the first time, world graphics would occasionally load slowly causing for textures to pop-in gradually for the first 30 seconds or so until everything was rendered. There were a few instances that the screen tore as well, even running The Division 2 on my Xbox One X. In the Dark Zone, I encountered an entire region that refused to render fully no matter how long I stayed in the area. The graphical issues for the most part have been on the periphery and haven’t affected my experience, but issues with running into invisible walls or staircases that were not accessible has been a minor irritant throughout the game. There was also an instance where I was taking a Control Point but my reinforcements stopped 10 feet before the point, so it didn’t complete the mission. An hours later they were still there, until I reloaded the game and reset the point. While the annoyances are mostly on the margins of the game, the various improvements that have been implemented are consistently noticeable. There are a lot of what I like to refer to as “Quality of Life” features in The Divisions 2; the types of minor things that just make your life easier in a game, especially when it relates to things that are typically irksome in these types of MMORPGs. Features like being able to deconstruct equipment anywhere in the world, or dismantle active skills to decrease their cooldown. While small facets of the gameplay, they save a lot of time that would typically be spent fast-traveling back to base. If you want to go after some really high-end gear, you can venture into the contaminated Dark Zone. 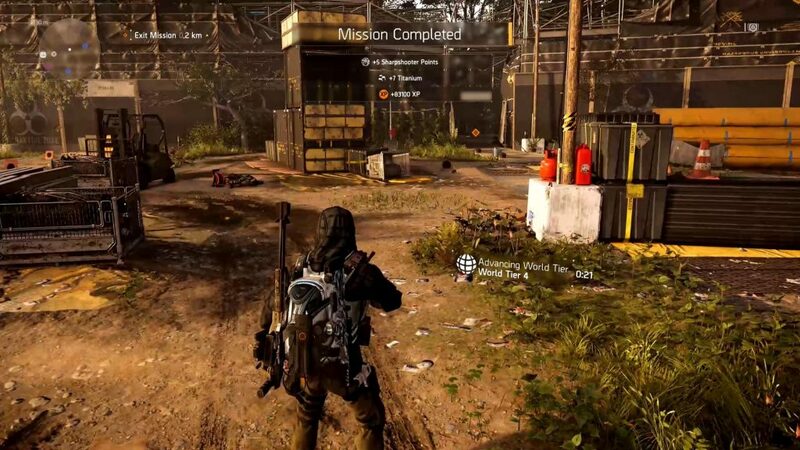 There are multiple ways to find gear in the Dark Zone, but the two most profitable come from exploring and clearing Landmarks, and encounters with other players. 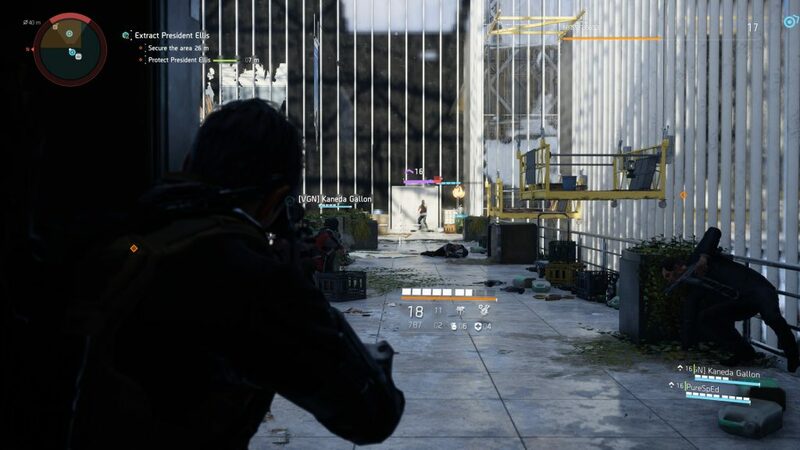 Upstanding Division Agents will focus on the higher tier enemies and frequent Bosses that can be found around Landmarks, as clearing one always nets the player a piece of Gear. You can also unlock Dark Zone chests if you’ve been lucky enough to find a key, or are daring enough to pick the lock and go Rogue. Rogue Agents; the most exciting, irksome, and terrifying aspect of the Dark Zone. Veterans of The Division will remember all-too-well what it means to be traveling to extract the gear from the Dark Zone — the only way to safely remove contaminated gear from the area — only to encounter another group of players at the extraction zone. It’s these tense moments which make for some of the most exciting gameplay in The Division 2. 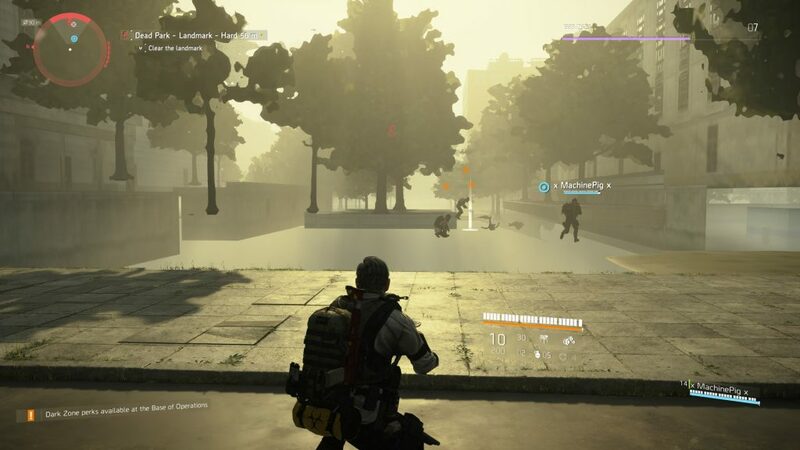 You can attack another player and attempt to kill them and steal their yellow loot-bag, but as soon as you deal damage to a player you acquire Rogue status from Division Headquarters; which puts a target on your back for any players looking to score Dark Zone gear; or any good Samaritans hunting down Agents influenced by Aaron Keener’s vision. 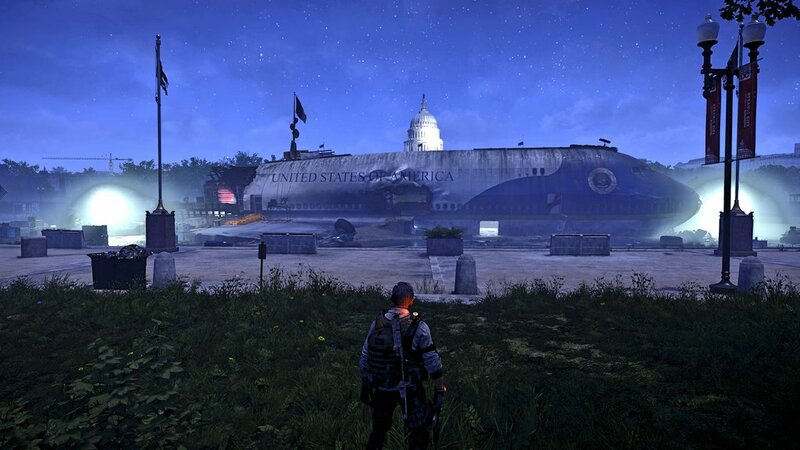 The journey to level 30 represents the core story arc of The Division 2, with each mission linked directly to the reclamation of Washington D.C. There is no right or wrong way to level per se; an agent could try to blitz through the story missions as fast as possible, performing the occasional side activity for extra experience points when needed (as many missions have a level requirement). Or a player could approach their play through like our resident First Wave Agent AcuteJungle66, who meticulously progressed zone-by-zone; completely all the activities — main missions, side missions, projects, hidden objectives —in each area before moving on to the next. This resulted in him reaching level 30 with two areas still unexplored and yet to attempt the Strongholds, and also could explain how he managed to rack up 38 hours of play-time by launch day. Once the player has completed the 3 Strongholds — which are effectively missions, but substantially more epic — the initial story arc is complete. The reward is a few cut-scenes and the advancement to World Tier 1, which is the beginning of the end-game. Veterans of The Division will be no stranger to the concept of World Tiers and Gear Score, although the implementation of these mechanics is slightly different this time around. Whilst World Tier still affects the maximum Gear Score of items, advancing to the next tier is locked behind a progression barrier. In order to advance to the next World Tier the player must complete an ‘Invaded’ Stronghold, and each Stronghold is locked behind respective ‘Invaded’ Missions as well as a minimum required Gear Score. Once the first Stronghold has been conquered the player advances to World Tier 2, once again needing to complete Invaded Missions and tackling an Invaded Stronghold once they have reached the target Gear Score in order to progress. 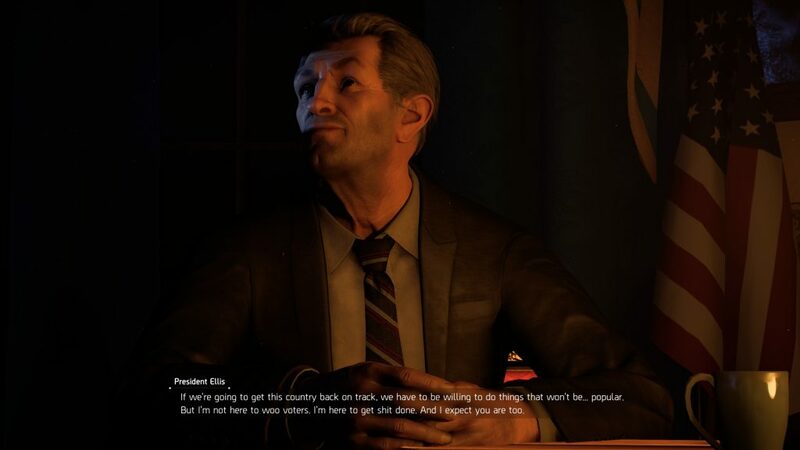 This aspect of The Division 2 is not going to be for everybody and is often misunderstood as being somewhat repetitive, but it serves a deliberate purpose: progressing the story arc further and introducing new mechanics. Even so the actual locations are the same as before, the way each respective Mission and Stronghold plays out is considerably different to their pre-invasion counterparts. With new objectives and enemies, as well as being considerably more challenging; this post-level 30 grind still feels fresh and new: even the world itself is completely different at this point in the game, as the streets of Washington D.C. are full of a diverse range of dangerous threats. The current state of the end-game is far from simple. There are plenty of activities to complete upon reaching World Tier 4: Daily Missions, Daily and Weekly Projects, Bounties, pursuing Exotic Weapons, unlocking secrets (such as hunting down Hunters), farming Vanity Items (plenty of backpack charms to find), chasing Commendations (many of which unlock patches), and of course attaining more Specialisation Points for your chosen spec: Demolitionist, Survivalist, or Sharpshooter. If anything, it is somewhat overwhelming once you reach World Tier 4; but notice that I have left out optimising your gear, the process that is often referred to as ‘min/maxing’. As whether there is any point in doing so is currently debateable, because World Tier 4 is not the pinnacle of The Division 2. Yes, it is currently the highest tier an agent can reach, with the soft Gear Score cap being 450 (slightly higher items can appear out of Field Proficiency Caches); but the true end-game is World Tier 5, which has not been released yet (progression to World Tier 5 is locked behind the Tidal Basin Stronghold, which is currently inaccessible). World Tier 5 will raise the Gear Score cap to 500, and introduce the best type of gear that Veteran SHD Agents will be all too familiar with: Gear Sets. 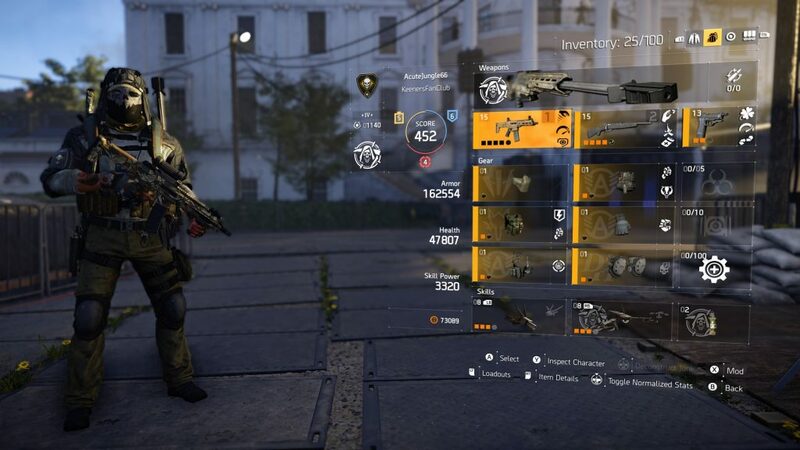 Whilst The Division 2 currently has quasi-gear sets in the game from various brands, the true Gear Sets will feature considerably powerful set-bonuses that will most likely be tailored to certain specializations. As it stands, the (sort of) end-game is considerably challenging and rewarding; but the knowledge that all the hard-earned armour and weapons will be superseded by items with a higher Gear Score very soon is bittersweet. Massive Entertainment have stated that World Tier 5 is temporarily delayed whilst they work on fixing some of the bugs that currently exist, which is reminiscent of when the Survival DLC for the original game was delayed in order to improve the core gameplay experience. So whilst many players may feel frustrated that they cannot currently reach the true pinnacle of end-game, one has to appreciate the developer’s commitment to excellence. 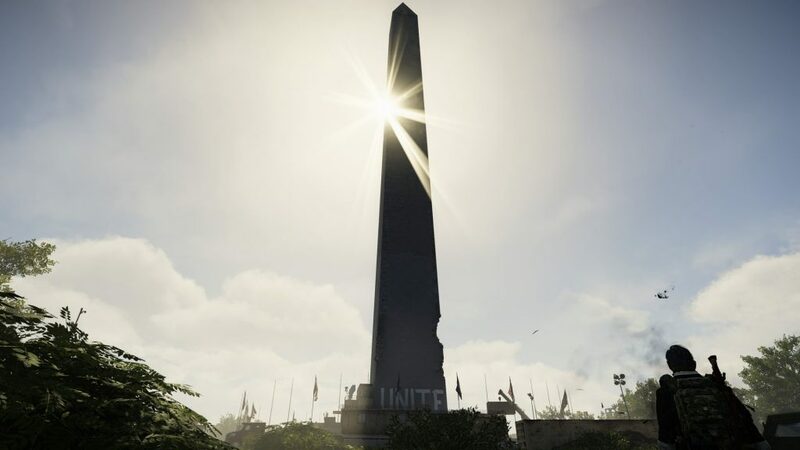 There is no denying that The Division 2 has a more pronounced end-game much earlier in its life-cycle in comparison to the original (AcuteJungle is currently sitting at 120 hours played), but given the roadmap for the next year: the game is just getting started. Even marred by some irksome graphical issues, The Division 2 is still a fantastically engrossing and entertaining game. It’s a world that I can spend hours upon hours in, with gameplay that never seems to get tiring as repetitive as the structure may feel at points. 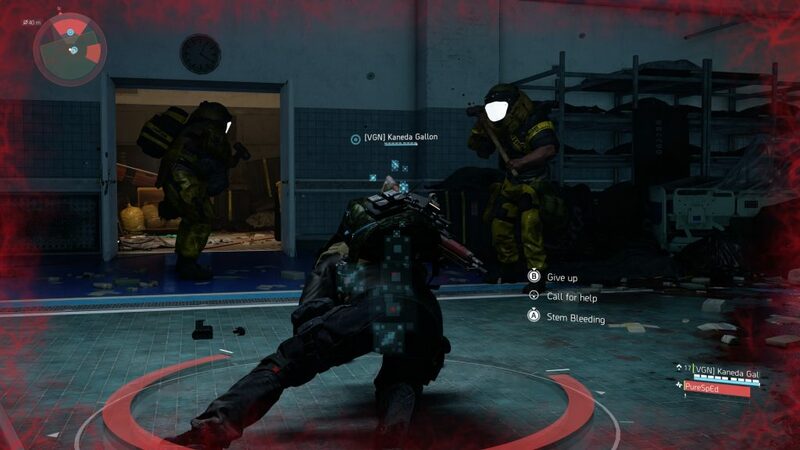 Players looking for a captivating looter-shooter need look no further, as Ubisoft have went to lengths to ensure that the same type of stagnation often felt in similar games is not evident here. 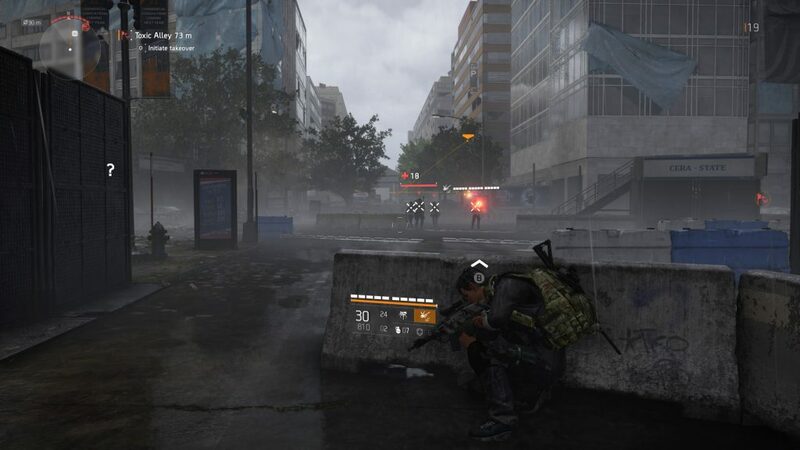 Tom Clancy’s The Division 2 is ultimately the culmination of everything that Ubisoft has learned since their initial foray into the emergent looter-shooter genre in 2016. Three years and many patches and experiments with different types of content have led us to Washington D.C., and a polished and all-together fantastic conceptualization of a pandemic-torn urban environment. While the release had trouble shaking some minor yet irksome gameplay and graphical bugs, it’s been a thoroughly entertaining experience that I know I will continue to delve into. 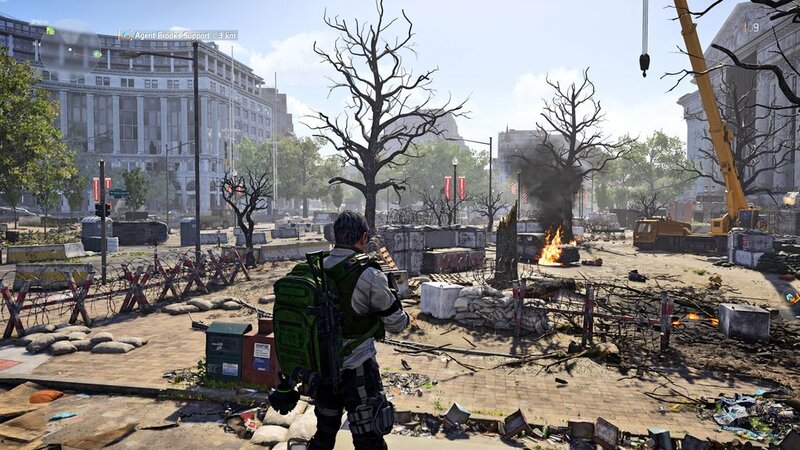 An engrossing, beautiful world and evolutionary gameplay make The Division 2 one of the best looter-shooters on the market, only detracted by some unfortunate bugs and a still-growing endgame.